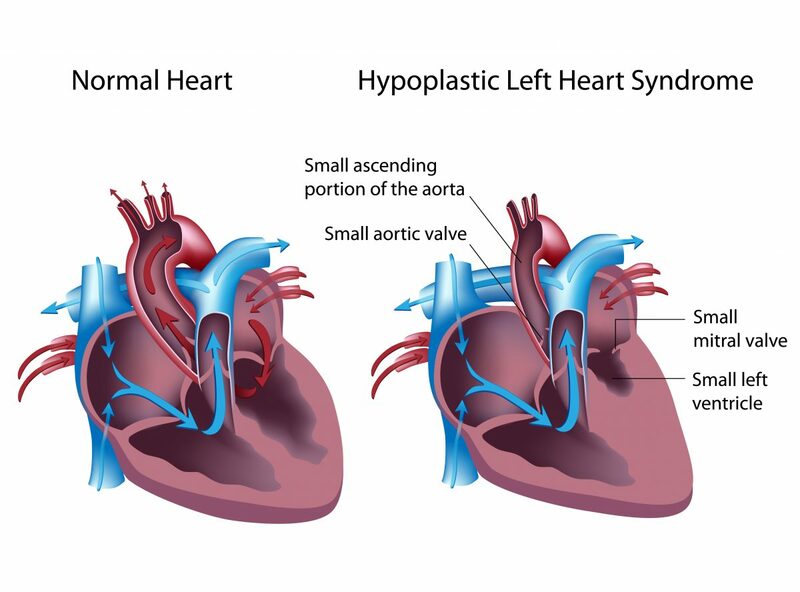 Hypoplastic left heart syndrome (HLHS) is a complex and severe congenital heart defect, making it one of the most challenging heart defects to manage. Without surgical treatment in the neonatal period, the defect will prove fatal. The “left heart” is that part of the heart that receives oxygenated (oxygen rich) blood from the lungs and pumps that blood to the body. In the normal heart, oxygenated blood flows from the lungs into the left atrium (upper collecting chamber), then passes through the mitral valve into the left ventricle (lower pumping chamber). The left ventricle ejects this blood through the aortic valve into the aorta and the blood supplies all portions of the body through the system of arteries. As the blood passes through the various organs and tissues of the body, the oxygen is taken out of the blood. This deoxygenated (oxygen poor) blood returns to the right atrium and passes through the tricuspid valve into the right ventricle. The right ventricle ejects this blood through the pulmonary valve and pulmonary artery to the lungs, where the blood once again becomes oxygenated. The cycle starts again as this oxygenated blood returns to the left atrium. Hypoplastic left heart syndrome is a defect where the structures of the left heart are hypoplastic (very small) or not formed at all. The mitral and aortic valves are either severely narrowed or completely closed. The left ventricle and the first portion of the aorta (ascending aorta) are very small. The left heart is not adequate in size to support blood flow to the body and to sustain life. The right ventricle, as the only functional ventricle, must pump blood to both the lungs and the body. The oxygenated blood from the lungs passes from the left atrium to the right atrium through an atrial septal defect (hole between the right and left atria). This blood mixes with the deoxygenated blood and passes into the right ventricle. The right ventricle ejects this mixed blood into the pulmonary artery. A portion of this blood flows to the lungs and the rest flows through the patent ductus arteriosus (PDA) into the aorta to supply the body. The ductus arteriosus is a blood vessel that connects the pulmonary artery to the aorta and is present in all babies before birth. It naturally closes within the first several days after birth, but it can be kept open with a medication called prostaglandin E1 (PGE1). Administration of PGE1 allows the baby to survive until life-saving surgery can be done. How frequent is hypoplastic left heart syndrome? Unfortunately, hypoplastic left heart syndrome is not a rare defect. The Centers for Disease Control and Prevention (CDC) estimates that approximately 960 babies are born each year in the United Stated with HLHS. This defect accounts for 4-9% of all babies born with heart defects. The diagnosis of HLHS, as well as other heart defects, is usually made with ultrasound studies during pregnancy. If a heart defect is suspected by the obstetrician, the expecting mother is usually referred to a pediatric cardiologist for a fetal echocardiogram (a more detailed ultrasound study that specifically looks at the heart structures). Making the diagnosis before delivery is very helpful in planning for delivery at an appropriate hospital and starting necessary care on the baby. Some babies are not diagnosed until after delivery. While the ductus arteriosus remains open, the baby may not have any symptoms. However, when the ductus arteriosus starts to close, blood flow to the body decreases and the baby may become acutely ill. Symptoms may include rapid breathing, pale or blue appearance, cool arms and legs, decreased feeding, weakness or lethargy, and decreased urine output. Immediate medical care is needed at that point to resuscitate the baby and prevent death. Echocardiography (an ultrasound study of the heart) is generally the only medical test needed to confirm the diagnosis and define the heart structures. Chest x-ray and electrocardiography (EKG) are obtained before surgery. It is uncommon to need other tests such as CT scan, MRI or cardiac catheterization. After the baby is born, intravenous infusion of prostaglandin E1 (PGE1) is started. This prevents closure of the ductus arteriosus so that blood flow to the body is maintained. The baby is carefully monitored in the neonatal intensive care unit (NICU) or cardiac intensive care unit. If the baby is stable, the baby may be allowed to eat or feedings may be given through a nasogastric tube (a tube in the stomach placed through the nose). Some babies may be more ill and will require medications to improve the heart function or assistance with breathing by a ventilator. A baby born with HLHS will not survive without surgical therapy. Furthermore, there is no possibility of curing HLSH with surgery. A series of operations is performed that allows the patient to survive with this defect. This is called surgical palliation. 1. The hypoplastic aorta is enlarged and attached to the first portion of the pulmonary artery to provide an unobstructed pathway for blood to flow from the right ventricle to the body. 2. The atrial septal defect is enlarged so that oxygenated blood returning from the lungs can flow easily into the right ventricle. 3. An artificial tube graft is placed to provide blood flow to the lungs. This graft may arise from a branch off of the aorta (BT shunt) or directly from the right ventricle (Sano shunt). The Norwood procedure is a complex and technically challenging operation. It carries the highest risk of the three operations that will be performed. The baby may remain in the hospital for several weeks after the Norwood procedure. This operation is usually performed at about 6 months of age. The superior vena cava is removed from the right atrium and sutured to the pulmonary artery. This allows the deoxygenated blood returning from the upper body to flow directly to both lungs without passing through the heart. The BT or Sano shunt is removed. This operation is usually performed after two years of age. 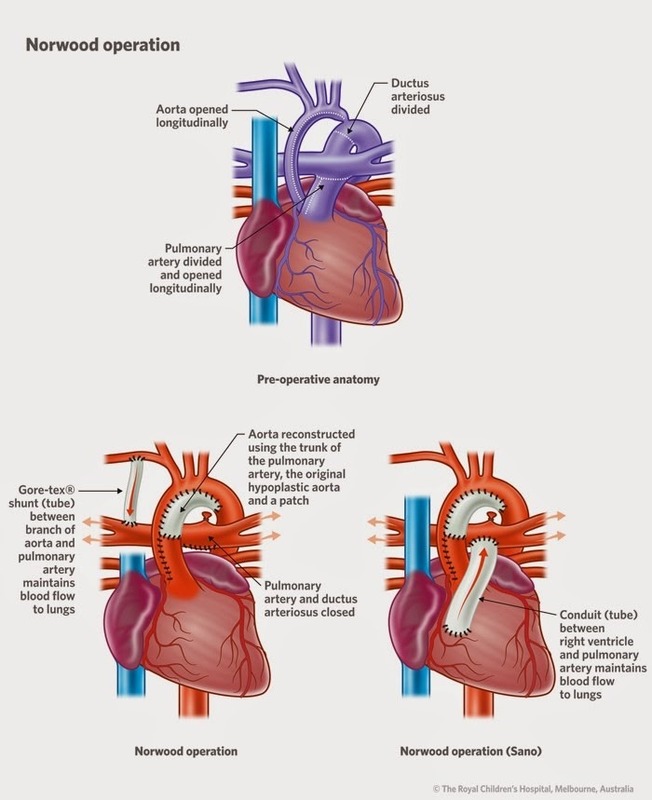 A connection is made from the inferior vena cava to the pulmonary artery so that the deoxygenated blood from the lower body flows through the lungs without passing through the heart. There are various techniques for performing this operation, but the same objective is achieved. Almost all medical centers that treat HLHS prefer to perform the three stages of surgical palliation. However, in some instances, it may be necessary to perform cardiac transplantation if the risk of surgical palliation is too high. 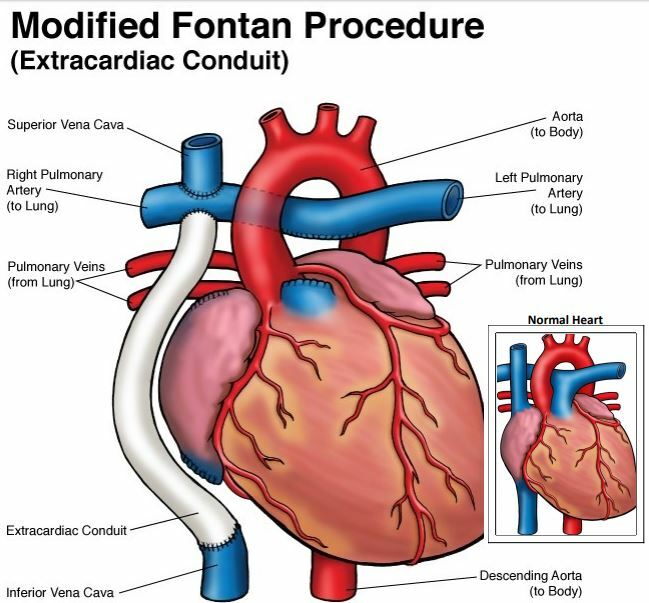 Cardiac transplantation may also be necessary after surgical palliation has been performed if the patient suffers significant complications from the Glenn and Fontan procedures. There is a risk that a baby with HLHS may die before a donor heart becomes available. Also, there are significant possible complications that can occur after transplantation, especially those related to the medications used to prevent rejection. What is the long-term outlook for patients with hypoplastic left heart syndrome? It is very important that patients with HLHS be routinely followed by a cardiologist who has special training in caring for complex congenital heart problems. Medical or surgical treatment may be necessary if complications develop. Dr. Steven Leonard, MD, FACS, FAAP, is a Pediatric Cardiothoracic Surgeon at Rocky Mountain Hospital for Children. If you or someone you know has received a fetal diagnosis like HLHS, please contact us. 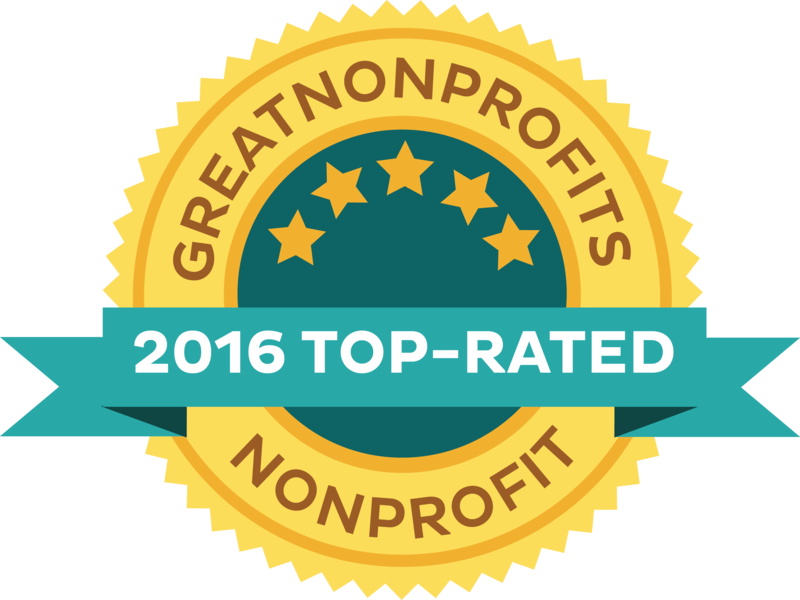 Our parent-founded non-profit has resources and can connect you with people who have been there and people who can help.